A lot of 2002 owners know that a good source to turn to for “upgrades” for a 2002 is to the 320i. Not only did the 320i have more updated equipment but a lot of it is compatable with the 2002. And that equipment can be put into a 2002 without too many modifications. The bonus is there are a lot more 320s out there in the salvage yards than 2002s any more. One up grade you can make is to put a 320 radiator into a 2002. I made that conversion on my own car here are some tips to help you make that conversion. 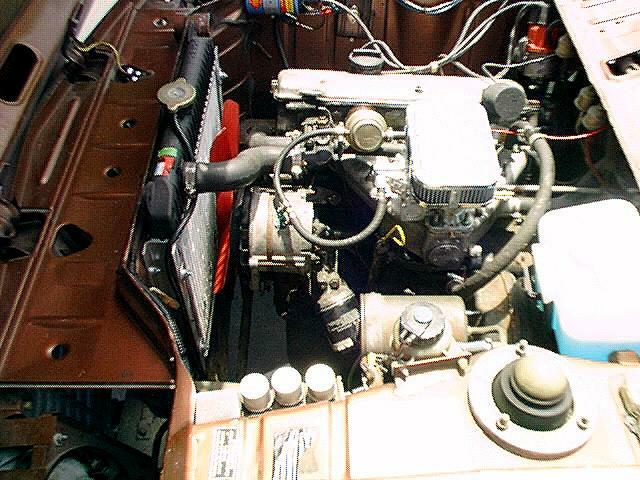 The 320 radiator was designed to be mounted with the lower tank resting in rubber “cradles”, and shock mounted on the top tank via the protruding “ears”. 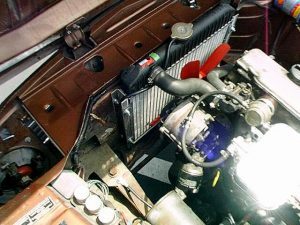 But when installing the 320 radiator into a 2002, most installations utilize the side flanges, that (I believe) are meant to mount a fan shroud, nevertheless, these flanges seem to be sufficient enough as they haven’t failed yet, nor do I know of anyone else who has had a problem as well. I’ve seen a couple different mounting methods, most common are “hose” mounted and “flange” mounted. Take a section of small hose (1/4″ id) long enough to make a “standoff” from the front bulkhead, slightly longer than the width of the radiator then simply match drill thru, and secure w/ a bolt, washers and “aircraft” nut. I have this set up on my ’76. I had two aluminum channels fabricated from .125″ material, dimensions: base 1.75″ X 1.00″ legs X 21″ long. First mount the channels to the radiator, I added a fender washer to the radiator side for some added “gripsion”. Install radiator into ’02, (I spaced the bottom of the radiator 1/8″ off the body with some cardboard taped in place). Remove existing “nutclips”, use the existing holes on right side bulkhead, mark channel from backside (make sure to remove the grilles first), take out and drill holes in right channel. On the left side – drill holes in channel first then w/ radiator back in ’02 mark the bulkhead, remove radiator and drill holes, then final assembly. Hoses: Upper – no change, it’s the same, some trimming may be required. Lower – use a 320 hose, but you have to take about 1.5″ out of the straight section. To do this put the radiator in and “eyeball” where the 1st cut should be. Then cut the hose and fit it to both the radiator and the thermostat, then mark both where final cuts will be. Next you’ll need a coupling, use a 1.5″ PVC hose coupling available at hardware stores, and hose clamps. One bad aspect w/ the 320 radiator, it’s aluminum, so if you happen to puncture it, sorry it’s toast, no fix, adios $200. I know, my fan blew up. Arne Carlson lives in Santa Cruz County California and drives a ’76 2002.